Merry Monday Link Party #52! It’s time for another week of Merry Monday marvelousness! Keep reading to check out my features….and add your links! Welcome to the Merry Monday Link Party #52! Just in case you missed it last week, we have NEW HOSTS! We would like to welcome Christine from Where The Smiles Have Been (that’s me! ), Ash from Ash and Crafts, and Chelc from Inside the Fox Den. Please show them some bloggy love and visit them on their blogs and social media. Make sure you let them know you’re visiting from #MerryMonday! 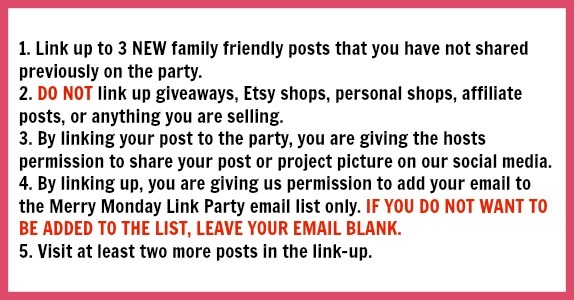 We’re looking for ONE MORE HOST for the Merry Monday Link Party! If you’re interested in being a permanent host, please sign-up HERE. We love ALL the helpful blogging tips shared on each Merry Monday Link Party! So, to help our fellow bloggers, we’ll be sharing the blogging tips and tricks linked to the party in the party email reminders! Our third Spring Craft Blog Hop is now OPEN! This hop is focusing on Easter, Mother’s Day, Recycle crafts, Earth Day, Teacher’s Day, May Day, Cinco De Mayo, and general spring crafts. If your craft fits these themes, come link-up and be seen on 19 blogs! The last Spring Craft Blog Hop will be from May 26th to June 20th! It will focus on Father’s Day crafts, general Summer, July 4th, etc. Want to help host the last Spring Craft Blog Hop?? We’re planning a special Summer Salad party for you to link-up just summer salads! If you would like to help host this special link party, please sign-up HERE! Meet the Hosts of Merry Monday! Let’s See What the Hosts Have Been Up To Lately…. Display this button on your sidebar or party page! If YOU were featured, grab a STAR button and display it on your blog! Classroom Valentine’s Day Decor for Parties or Room Doors! Thank you so very much for the feature this week, Christine! Super excited that you liked it :) Looking forward to all of the fabulous projects I will get to check out and pin at the MM Link Party this week!